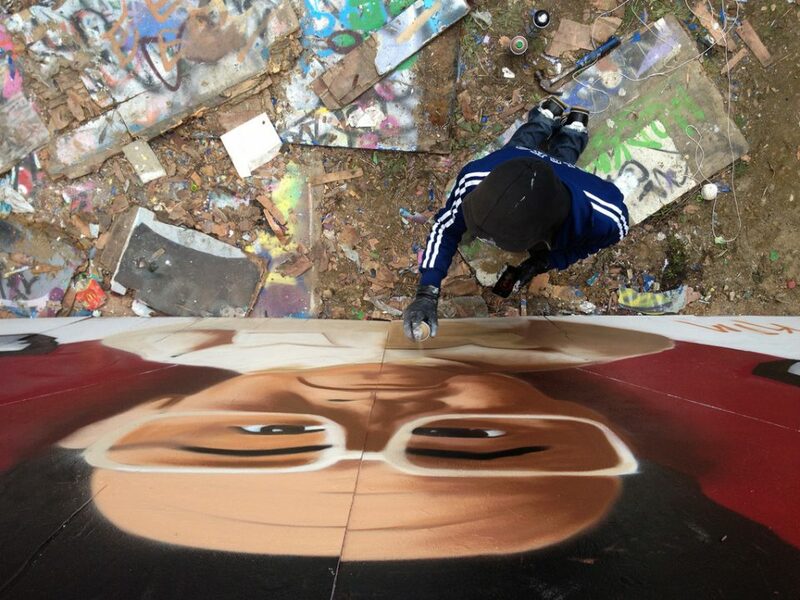 North Korea may be making the headlines like never before but the world’s graffiti artists have been featuring the Hermit Kingdom’s leaders for years. When it comes to North Korea, there’s a lot to look down on. Take the country’s unique leadership – a communist dynasty? Who knows what the late Karl Marx might think of that (though it’s not hard to guess). 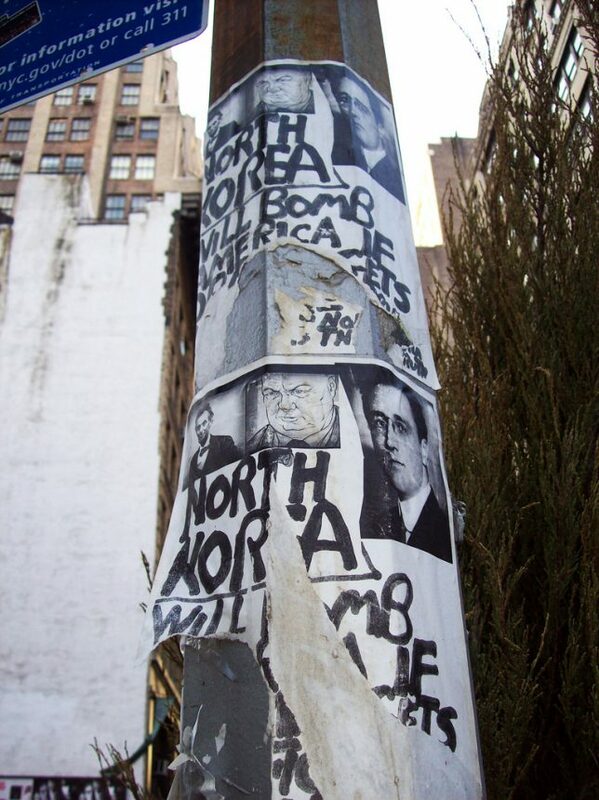 In any case, NK-themed graffiti and street art should never be looked down upon, at least not by those living outside North Korea. 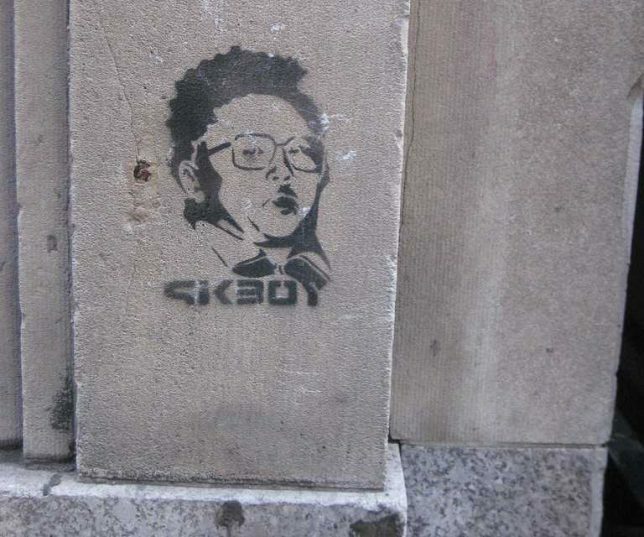 Flickr user _eddie999_ brings us our lead image featuring Team America: World Police’s take on Kim Jong-il, snapped in Brighton, UK early in 2012. 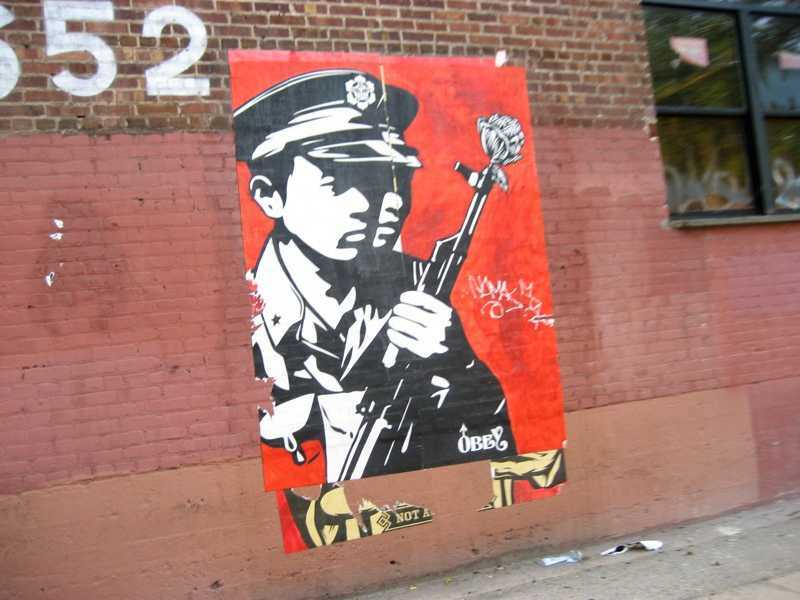 Just below, Mauricio Balvanera’s (maubrowncow) 2007 photo of a stenciled North Korean soldier with a flower in the muzzle of his rifle gazes out from a wall near the Toy Factory Lofts in Los Angeles, California. Kim Il-sung (“Kim become the sun”) was North Korea’s first supreme leader – the “Great Leader” in official parlance – who held power from 1948 to his death from natural causes in 1994. Among his most lasting accomplishment was the establishment of the Kim ruling dynasty, now into its third generation in the form of Kim Jong-un. 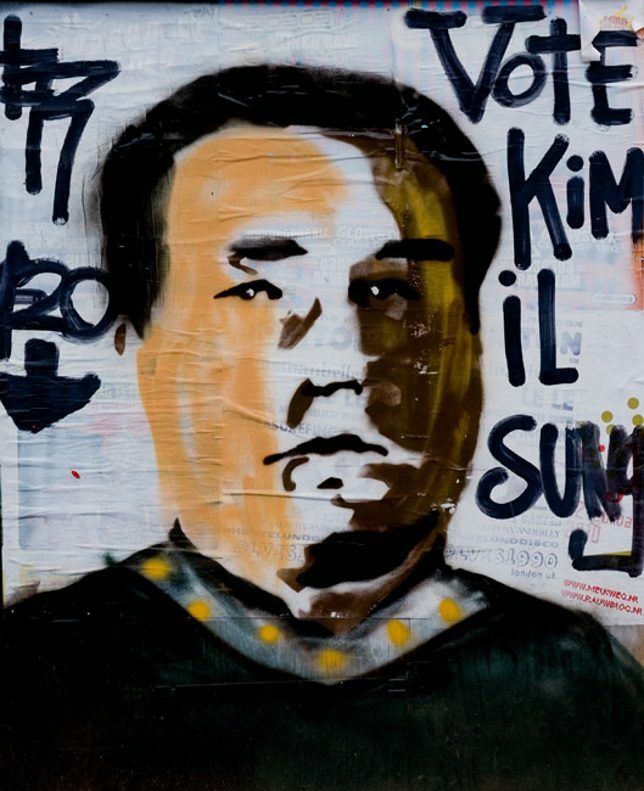 Speaking of lasting accomplishments, Flickr user Loïc Brohard snapped the above artwork captioned “Vote Kim il Sung” in Amsterdam, the Netherlands, in April of 2010. Kim Jong-il inherited power from his father in 1994 and was known in North Korea as the “Dear Leader”. 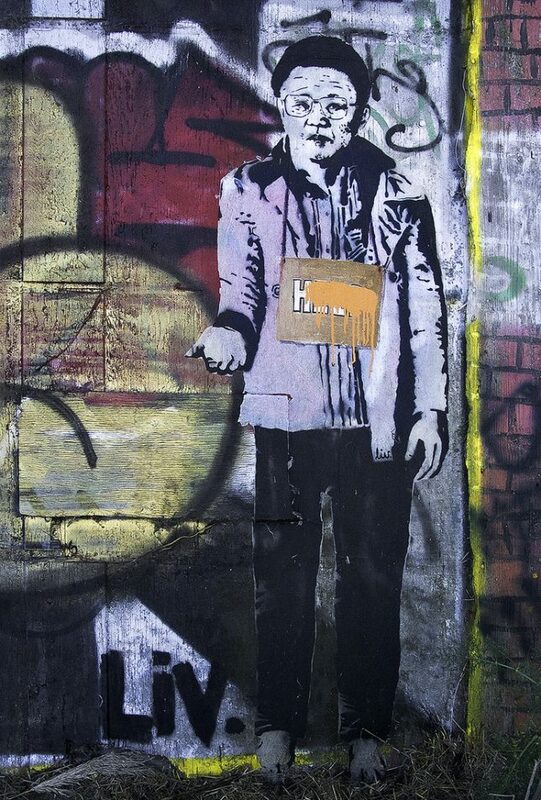 Flickr user Larry Jones (westbymidwest) captured this full-color portrait of Kim Jong-il in full panhandler mode on September 20th of 2009 at the Albany Bulb, an artificial landfill peninsula extending westward from the the east shore of San Francisco Bay. It’s uncertain whether the splash of orange paint across the portrait’s “HELP” sign is part of the original composition or a later amendment. Kim Jong-il was over 50 years old when he assumed North Korea’s leadership but he had been groomed for the position since the early 1980s. Kim the Second raised the cult of personality established and encouraged by his father to ever-greater heights. The stencil above, found in NYC’s Koreatown district, dates from 2009 and was captured in April of that year by Flickr user e.yamasaki. 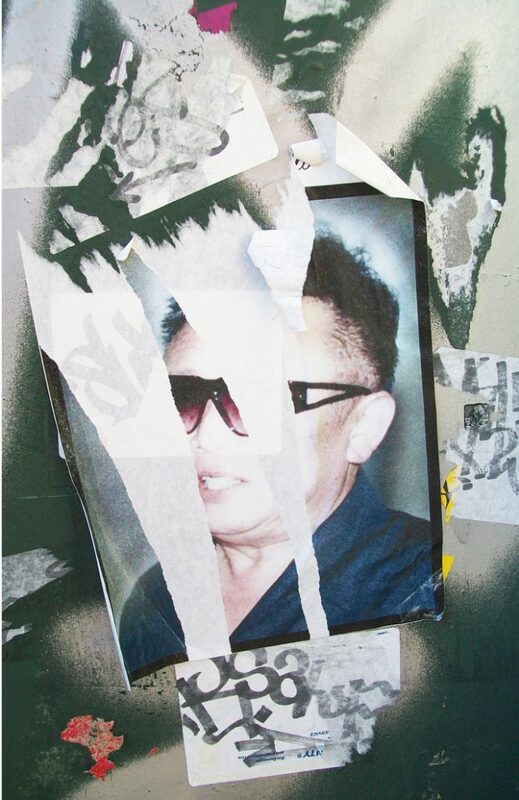 Kim Jong-il’s designer shades take center stage in the above NYC photo pastiche snapped in late 2011 by Flickr user allan molho (amolho4). Sources state Kim Jong-il was a fervent fan of Western cinema, boasting a collection of over 20,000 titles including every Elvis Presley flick. His fascination with “The King” in his late-1960’s rhinestone jumpsuit phase may have influenced Kim’s sartorial preferences, at least when it came to prescription and fashion eyewear. First rule of tinfoil-hat prognostication and doomsday cult propaganda: never predict near-future events! The unknown creator of the above paste-up mini-manifesto evidently didn’t get that memo. To their credit, they did manage to evoke the spirits (and images) of Lincoln, Churchill and an alarmingly youthful FDR to add weight to their shrill Cassandra callout. 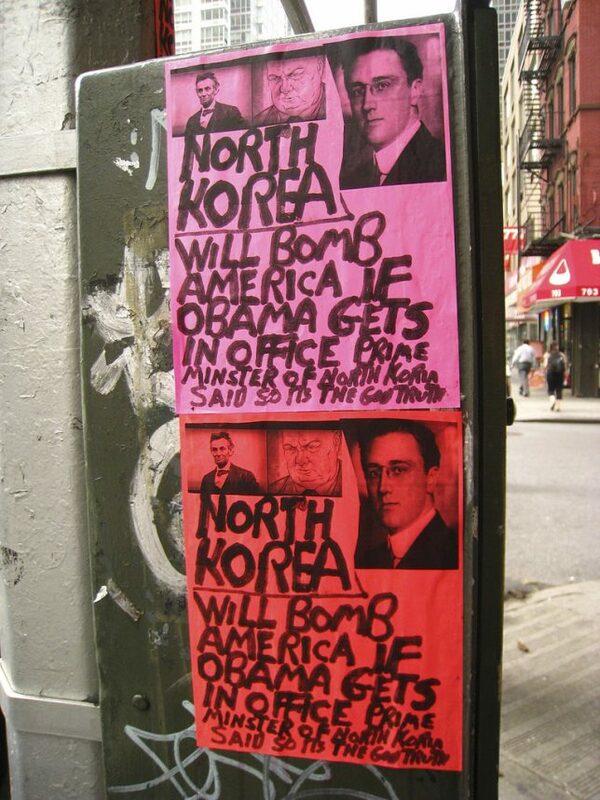 Bonus: stating “Prime minister of North Korea said so its the God truth.” Kudos to Flickr users shoehorn99 and allan molho (amolho4) for capturing these ravings in August of 2008 and April of 2009, respectively.